We offer the finest Handmade Kepi's & Forage Caps available. We use only the best materials. They feature a heavy leather brim, functional chin strap with brass side buttons and center buckle, leather sweat band, and are lined. 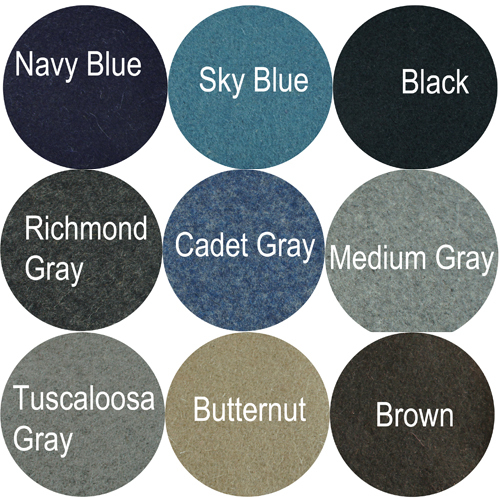 If the kepi and forage caps options below don't meet your needs, call us to discuss your specific customization. All Caps and Hats with the exception of STANDARD Colors, Styles, and Sizes as listed below are custom made specifically for you and are subject to a restocking fee. Hat Size Guide, measuring the circumference of your head, above the ears, with a cloth tape measure. Small - 6 5/8" - 6 7/8" - approximately 21"
Medium - 7" - 7 1/8" - approximately 22"
Large - 7 1/4" - 7 1/2" - approximately 23"
X-Large 7 5/8" - 7 7/8" - approximately 24"
The slouch hat is a wide-brimmed hat. The crown and brim can be shaped to the desire of the soldier. The slouch hat is correct for both US and CS officers and enlisted men. This Slouch Hat is made of top quality wool felt with a 3 1/2 inch wide brim. It has a sweatband. This hat is packable and water repellent. The hat is available in black, gray, or brown. Click on the picture to see the other colors. Hat cords, branch and unit insignia are available. The 1st Virginia cavalry often sported a black ostrich plume. This Slouch Hat is made of top quality wool felt with a 3 inch wide brim and a gros grain removable band. It has a sweatband. This hat is packable and water repellent. The hat is available in black, gray, or brown. Click on the picture to see the other colors. This slouch hat is made of top quality heavy wool felt with an approximately 3 inch wide brim. It has a sweatband. The brim is ribbon-edged. 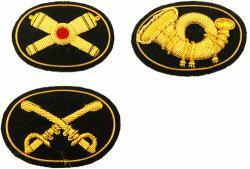 Hat cords, branch and unit insignia are available. The high quality planter hat is handmade of palma blanca leaves. The brim is 4" wide and the vented crown is 4" high. The hat features a cotton sweatband. The hat band can be removed for customization. The hat is ready to wear and can be crushed and reshaped and even washed. This hat will outlast a straw hat 5 to 10 times. 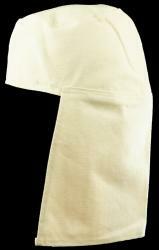 The high quality hat is handmade of palma blanca leaves. The brim is 4 1/2" wide and the shpaed crown is 4 1/4" high. The hat features a cotton sweatband. The hat band can be removed for customization. The US kepi is made in a navy wool for both cap and band. This kepi is correct for ALL branches of service. The kepi has a heavy leather brim, functional chin strap with brass side buttons and center buckle, leather sweat band, and is lined. The kepi is available in navy wool only. MADE IN USA in the great state of Idaho. The US kepi is made in a navy wool for the cap and artillery red wool for the band and is specific for Artillery. The kepi has a heavy leather brim, functional chin strap with brass side buttons and center buckle, leather sweat band, and is lined. The forage cap is taller than the kepi and the crown drapes forward. The cap has a heavy leather brim, functional chin strap with brass side buttons and center buckle, leather sweat band, and is lined. The US forage cap is available in blue wool only. For the re-enactor seeking 100% authenticity. This cap is made specifically for you. The forage cap is taller than the kepi and the crown drapes forward. The M1858 enlisted forage caps are made to an authentic pattern, sometimes called the "type 1" or "early pattern”, and are 80% hand-sewn. The cap is made in Navy blue wool and is lined. The brim is 7-8 oz. leather. The brim is dyed black, and is rough on the bottom, with a shiny top as were the original. The chin strap and sweat band are 2-3 oz. leather. The chin strap is dyed black and finished shiny on the front, but is left natural on the back, again as per the originals. The strap buckle is a copy of the original, and the strap is fixed to the cap with two small Union buttons, which are sewn on. The left slide on the chinstrap is sewn onto the strap, but the right one slides, so the strap can actually be worn under the chin, as per the originals. The sweatband is made from soft split leather, pre-dyed black, and is hand-sewn into the cap. These caps are custom made to your specific head size. Measure the circumference of your head, above the ears, with a cloth tape measure, in inches, when ordering. Please allow 4 weeks for your cap to be made and shipped. Measure the circumference of your head, above the ears, with a cloth tape measure. Indicate the measurement in inches in the box below. The forage cap is taller than the kepi and the crown drapes forward. The cap has a "McDowell" style brim of heavy leather, functional chin strap with brass side buttons and center buckle, leather sweat band, and is lined. The US forage cap is available in blue wool only. The US Berdan Sharpshooter Forage Cap is made of green wool. The forage cap is taller than the kepi and the crown drapes forward. The cap has a heavy leather brim, functional chin strap with black side buttons and center buckle, leather sweat band, and is lined. The Hardee hat, also known as the Model 1858 Dress Hat was the regulation dress hat for enlisted men in the Union Army. 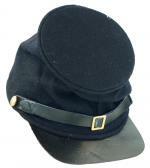 The Hardee hat was also worn by Confederate soldiers. The 1861 U.S. Army regulations specify the hat be adorned with a brass hat device designating corps, brass regiment number, brass company letter, and a wool hat cord denoting the branch of service of the wearer: sky blue for infantry, red for artillery, yellow for cavalry, crimson for ordnance, and green for mounted riflemen. The brim to be pinned up, with a brass eagle, on the right side for cavalrymen and artillerymen, and on the left for infantry soldiers. This Undressed Hardee hat is made of top quality wool felt, has a leather sweatband, and a double stitched brim edge. The hat is available only in black. Hat cords, brass eagle, insignia, plume, company letter and regiment number are available at an extra cost. This Dressed Hardee hat is made of top quality wool felt, has a leather sweatband, and a double stitched brim edge. The hat comes complete with Branch of Service brass enlisted hat insignia, Hardee hat eagle hat device, enlisted hat cord, and black ostrich plume. These dressed additions are not installed. The hat is available only in black. Company letter and regiment number are available at an extra cost. The Hardee hat, also known as the Model 1858 Dress Hat was the regulation dress hat for officers in the Union Army. For officer's the brim edge is is bound in black ribbon. The Hardee hat was also worn by Confederate soldiers. This Officer Hardee hat is made of top quality heavy wool felt, has a leather sweatband, and a ribbon-edged brim edge. The hat is available only in black. 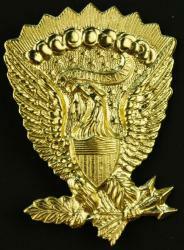 The 1861 U.S. Army regulations specify that the hat be adorned with an embroidered hat device denoting Branch of Service and a gold hat cord for general officers or a black and gold hat cord for Officers of the Adjutant General's, Inspector Generals, Quartermaster's, Subsistence, Medical and Pay Departments, and the Judge Advocate, above the rank of Captain. The brim is pinned up, with a brass eagle, on the right side for officers. The hat is accented with 3 black ostrich feathers for general officers and 2 black ostrich feathers for Officers of the Adjutant General's, Inspector Generals, Quartermaster's, Subsistence, Medical and Pay Departments, and the Judge Advocate, below the rank of Field Officer. Hatcords and insignia are available for an additional charge. This Dressed Officer Hardee hat is made of top quality heavy wool felt, has a leather sweatband, and a ribbon-edged brim edge. The hat comes complete with Large Embroidered Officer Hat Insignia, Brass Eagle Hat Device, Officer Hat Cord, and Black Ostrich Plume. These dressed additions are NOT installed. The hat is available only in black. Company letter and regiment number are available at an extra cost. This kepi is made in a solid color wool for both cap and band. The kepi has a heavy leather brim, functional chin strap with brass side buttons and center buckle, leather sweat band, and is lined. 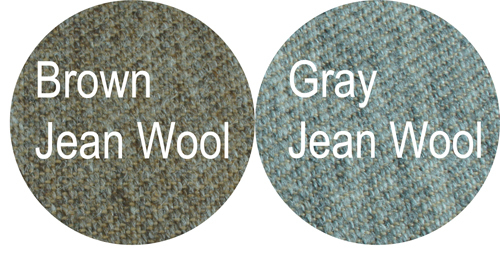 The kepi is available in several different wools. This kepi is made in a solid color jean wool for both cap and band. The kepi has a heavy leather brim, functional chin strap with brass side buttons and center buckle, leather sweat band, and is lined. The kepi is available in brown or gray jean wool. Early Confederate regulations called for the color of the kepi to indicate branch of service. The CS early war artillery kepi is red with a navy band. The kepi has a heavy leather brim, functional chin strap with brass side buttons and center buckle, leather sweat band, and is lined. This kepi is available in artillery red wool only. The CS early war cavalry kepi is yellow with a navy band. The kepi has a heavy leather brim, functional chin strap with brass side buttons and center buckle, leather sweat band, and is lined. This kepi is available in cavalry yellow wool only. The CS early war infantry kepi is blue with a navy band. The kepi has a heavy leather brim, functional chin strap with brass side buttons and center buckle, leather sweat band, and is lined. This kepi is available in infantry blue wool only. The CS late war artillery kepi is gray with a red band. The kepi has a heavy leather brim, functional chin strap with brass side buttons and center buckle, leather sweat band, and is lined. The CS late war cavalry kepi is gray with a yellow band. The kepi has a heavy leather brim, functional chin strap with brass side buttons and center buckle, leather sweat band, and is lined. The CS late war infantry kepi is gray with a blue band. The kepi has a heavy leather brim, functional chin strap with brass side buttons and center buckle, leather sweat band, and is lined. Select Sky Blue or Navy Blue band. The basic CS late war kepi is gray with a gray band. The kepi has a heavy leather brim, functional chin strap with brass side buttons and center buckle, leather sweat band, and is lined. The band color may be changed to indicated branch of service. The CS Lieutenant kepi has one row of gold Soutache braid on the top, sides, front and back of the kepi to indicate the Lieutenant rank. A single row of braid also encircles the hat above the band. The kepi is available with an optional single row of braid encircling the quadrefoil on the top of the hat for an additional charge. The kepi has a heavy leather brim, functional chin strap with brass side buttons and center buckle, leather sweat band, and is lined. The kepi is available in a variety of wool colors. The band color may be changed to indicated branch of service. 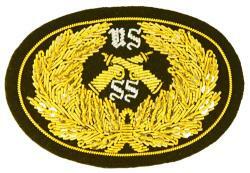 The CS Captain kepi has two rows of gold Soutache braid on the top, sides, front and back of the kepi to indicate the Captain rank. Two rows of braid also encircle the hat above the band. 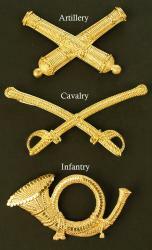 The CS Major, Lt Colonel, and Colonel kepi has three rows of gold Soutache braid on the top, sides, front and back of the kepi to indicate the officer rank. Three rows of braid also encircle the hat above the band. The kepi is shown with the optional single row of braid encircling the quadrefoil on the top of the hat. This braid is available for an additional charge. The CS General kepi has four rows of gold Soutache braid on the top, sides, front and back of the kepi to indicate the General rank. Four rows of braid also encircle the hat above the band. The forage cap is taller than the kepi and the crown draps forward. The cap has a heavy leather brim, functional chin strap with brass side buttons and center buckle, leather sweat band, and is lined. 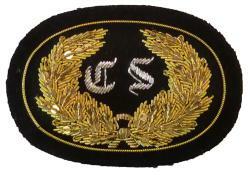 The CS forage cap is available in a variety of wools. The M1858 enlisted forage caps are made to an authentic pattern, sometimes called the "type 1" or "early pattern”, and are 80% hand-sewn. The cap is made in medium gray wool and is lined. The brim is 7-8 oz. leather. The brim is dyed black, and is rough on the bottom, with a shiny top as were the original. The chin strap and sweat band are 2-3 oz. leather. The chin strap is dyed black and finished shiny on the front, but is left natural on the back, again as per the originals. The strap buckle is a copy of the original, and the strap is fixed to the cap with two small Union buttons, which are sewn on. The left slide on the chinstrap is sewn onto the strap, but the right one slides, so the strap can actually be worn under the chin, as per the originals. The sweatband is made from soft split leather, and is hand-sewn into the cap. The forage cap is taller than the kepi and the crown drapes forward. The cap has a "McDowell" style brim of heavy leather, functional chin strap with brass side buttons and center buckle, leather sweat band, and is lined. A havelock is a cover for the kepi protecting the wearer's neck to prevent sunburn. The havelock buttons on to the exterior of the kepi using the kepi band buttons. The tarred havelock is a cover for the kepi protecting the wearer's head and neck from rain, The havelock buttons on to the exterior of the kepi using the kepi band buttons. Wool hat cord with tassels appropriate for the Confederate and Union enlisted man. The hat cord is fully adjustable. Available in Artillery Red, Cavalry Yellow, & Infantry Sky Blue. Imported. The Officer Hat Cord is made of Braided Black Silk and Gold Bullion Thread and features Black Tipped Gold Acorns. The hat cord is fully adjustable. Click on the picture to see more images. 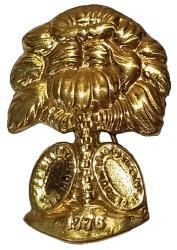 The Officer Hat Cord is made of Gold Bullion Thread and features Gold Acorns. The hat cord is fully adjustable. Imported. Click on the picture to see more images. The Officer Hat Cord is made of Braided Black Silk and Gold Bullion Thread and features Gold Tipped Black covered Acorns. The hat cord is fully adjustable. The Officer Hat Cord is made of Twisted Black Silk and Gold Bullion Thread and features Gold Tipped Black covered Acorns. The hat cord is fully adjustable. Imported. Crimson (Maroon), designating Ordnance, wool hat cord with tassels appropriate for the Confederate and Union enlisted man. The hat cord is fully adjustable. Imported. This beautiful Ostrich Plume will accessorize any hat, for Ladies and Men. Approximately 15" long. Available only in Black. These beautiful Ostrich Plumes will accessorize any hat, for Ladies and Men. Approximately 15" long. Available in Blue, Green, Red, Yellow, or White. Leather kepi strap with adjustable buckle. 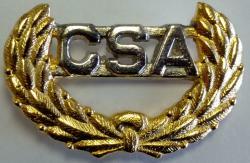 The brass "CSA" in Wreath Hat Insignia measures approximately 2 inches wide and 1 3/8 inches high. It has wire prongs on the back for attaching to the kepi, forage cap, or slouch hat. The M1851 Enlisted Hat Insignia is appropriate for both US and CS Enlisted Artillery, Cavalry, and Infantry troops and was used until 1872. It is made of stamped brass from the original dies and has a wire back for attaching to the hat. 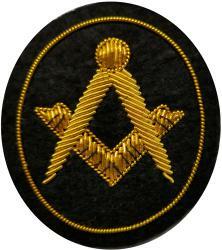 The insignia is about 3 1/2 inches wide and 2 inches high. 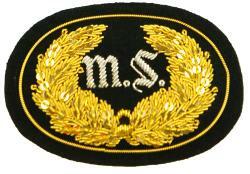 The M1851 Officer 'False Embroidered' Hat Insignia is appropriate for both US and CS officers of the Artillery, Cavalry, and Infantry. It is made of stamped brass from the original dies and has a wire back for attaching to the hat. 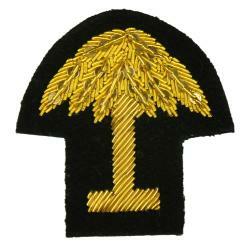 The SMALL insignia is about 1 5/8 inches wide and 1 1/4 inches high. 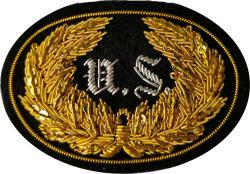 The LARGE insignia is about 3 inches wide and 1 3/4 inches high. 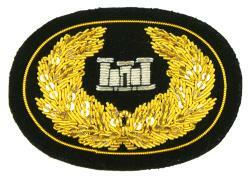 The M1851 Regimental Number Hat Insignia is made of stamped brass and is 5/8 inch high. It has wire fasteners on back for attachment. Click on the picture for a larger image. 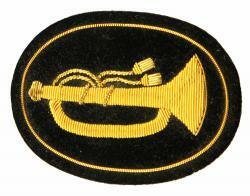 The M1851 Regimental Number Hat Insignia is made of stamped brass and is 1 inch high. It has wire fasteners on back for attachment. Click on the picture for a larger image. The M1858 Company Letter is made of stamped brass. Wire fasteners on back attach the insignia to the hat. The letter is 1 inch high. Click on the picture for a larger image. The Engineer Hat Insignia is appropriate for Enlisted Engineer troops. The insignia is made of stamped brass from the original dies and has a wire back for attaching to the hat. The Hardee Hat Eagle is for use on the folded side of the regulation Hardee Hat. It is made of stamped brass with a wire back for attaching to the hat. 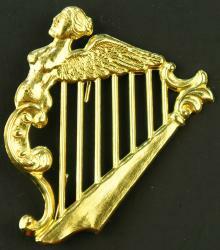 While not a regulation insignia, the Irish Harp is worn on hats and coats. The Irish Harp is made of stamped brass and is authentic to the original. There are wires on the back for attachment. The South Carolina Insignia is made of brass from the original dies and has two wires on the back for attaching to the hat. It measures approximately 1 7/8 inches high and 1 3/8 inches wide. 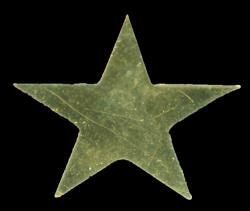 The Star Hat Ornament is made of solid brass with wires on the back for attaching to the hat. 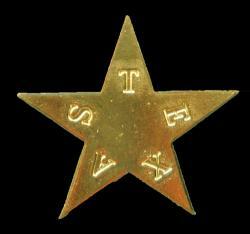 The Texas Star Hat Ornament is made of solid brass with wires on the back for attaching to the hat. The 1858 Ordnance Hat Insignia is appropriate for Ordnance Department enlisted troops. 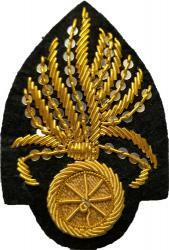 The insignia is made of brass from the original dies and has a wire back for attaching to the hat. The 1858 Rifleman Hat Insignia is appropriate for Mounted Rifles enlisted troops. 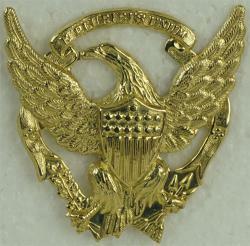 The insignia mounts vertically as shown. The insignia is made of stamped brass from the original dies and has a wire back for attaching to the hat. The M1872 Enlisted Cavalry Hat Insignia is made of stamped brass from the original dies and has a wire back for attaching to the hat. The insignia is about 2 3/4 inches wide and 1 3/4 inches high. The M1872 Enlisted Infantry Hat Insignia is made of stamped brass from the original dies and has a wire back for attaching to the hat. 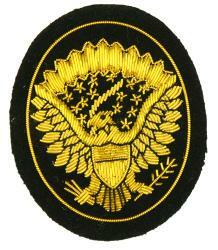 The insignia is about 2 inches wide and 1 1/2 inches high. The Indian War 1872 Shako Hat Ornament is made of stamped brass and has two wire loops on the back for attaching to the hat. It measures approximately 1 1/2 inches high and 1 1/2 inches wide. Stamped brass company letters to sew on hats and garments. Limited to stock on hand. Sold "as is" and all sales are final. Click on the picture to enlarge. Select Insignia: - LETTER: E, SIZE: 1" - LETTER: U, SIZE: 3/4" - LETTER: U, SIZE: 1"
First Corps badge, Army of the Potomac, the sphere, was adopted March 21, 1863. Second Corps badge, Army of the Potomac, the trefoil, was adopted March 21, 1863. Third Corps badge, Army of the Potomac, the lozenge, was adopted March 21, 1863. Fourth Corps badge, Army of the Potomac, the equilateral triangle, was adopted March 26, 1864. Fifth Corps badge, Army of the Potomac, the Maltese Cross, was adopted March 21, 1863. Sixth Corps badge, Army of the Potomac, the Greek Cross, was adopted March 21, 1863. Seventh Corps badge, Department of Arkansas, the crescent with star, was adopted January 6, 1865. Eighth Corps badge: Middle Department, 6 pointed star. Ninth Corps badge, Department of Ohio, Army of the Potomac, shield with fouled anchor and cannon, was adopted April 10, 1864. Tenth Corps badge, Department of South, the four-bastioned fort. Eleventh Corps badge, Army of the Potomac, the crescent, was adopted March 21, 1863. Twelfth Corps badge, Army of the Potomac, the star, was adopted March 21, 1863. Fourteenth Corps badge, Army of the Cumberland, the acorn, was adopted April 26, 1864. Fifteenth Corps badge, Army of the Tennessee, the transverse square and cartridge box with the motto '40 rounds', was adopted February 14, 1865. Sixth Corps badge, Military Division of West Mississippi, the circle with four minie balls cut out. 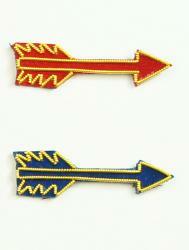 Seventeenth Corps badge, Army of the Tennessee, the arrow, was adopted March 25, 1865. 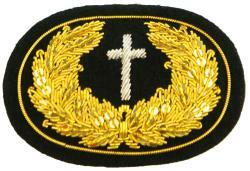 Eighteenth Corps badge: Army of the James, trefoliate armed cross, was adopted June 7, 1864. Nineteenth Corps badge, Middle Military Division, was adopted November 17, 1864. Twentieth Corps badge, Army of the Cumberland, five pointed star adopted from the twelfth corps, was adopted April 26, 1864. This corps was created in 1864 from the 11th and 12th Corps. 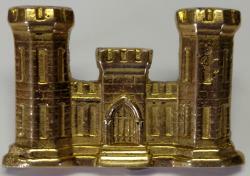 Twenty-second Corps badge, Department of Washington, the five bastioned fort. Twenty-third Corps badge, Department of Ohio and Department of North Carolina, the shield, was adopted September 25, 1864. Twenty-fourth Corps badge, Department of Virginia, the heart, was adopted March 18, 1865. This corps was created in 1864 from the white troops of the 10th and 18th Corps. Twenty-fifth Corps badge, Army of the James, Department of Texas, the square, was adopted February 20, 1865. This corps was created in 1864 from the black troops of the 10th and 18th Corps. 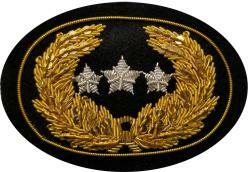 This officer hat device features gold embroidery on a black velvet field and is made with top quality craftsmanship. Click on the picture for a larger image. Imported. The SMALL hat device is approximately 2 7/8 inches wide and 2 inches high. The LARGE hat device is approximately 3 1/2 inches wide and 2 1/2 inches high. The LARGE hat device is approximately 2 1/2 inches wide and 3 1/2 inches high. The SMALL hat device is approximately 2 inches wide and 2 1/4 inches high. The LARGE hat device is approximately 2 1/2 inches wide and 3 inches high. The SMALL hat device is approximately 1 1/2 inches wide and 2 1/4 inches high. The LARGE hat device is approximately 1 7/8 inches wide and 2 7/8 inches high. 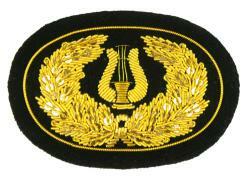 This officer hat device features gold embroidery on a black velvet field and is made with top quality craftsmanship. Click on the picture for a larger image. 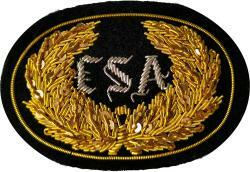 This US Sharpshooter officer hat device features gold embroidery on a black velvet field and is made with top quality craftsmanship. Click on the picture for a larger image. Imported. The LARGE hat device is approximately 3 1/4 inches wide and 2 1/4 inches high.